Mitsubishi Motors Philippines Corporation (MMPC) held a two-day event to promote EV and PHEV technology as next-generation cars. Last December, a symposium on Electric Vehicles and Plug-in Hybrid Electric Vehicles was held at De La Salle University (DLSU), Taft Avenue, in Manila which was attended by engineering students and some faculty members from De La Salle University, Mapua Institute of Technology, and University of the Philippines. The topics discussed during the symposium includes: Essentials of vehicle electrification to reduce carbon footprint on Philippine roads, and the technical features of Mitsubishi Outlander PHEV plug-in hybrid electric vehicle SUV and i-MiEV pure EV by MMPC; Plans and initiatives in support of EV Growth in the Philippines by Meralco; Developing the Electric Vehicle Industry in the Philippines by Electric Vehicle Association of the Philippines (EVAP); Clean Air Program Priority Activities by Department of Environment and Natural Resources (DENR); E-Vehicles in the Philippines by the Department of Transportation (DoTr), Overview on the Philippine Electric Vehicle Industry by the Department of Trade and Industry (DTI); and Future Plans and Projects in Tapping more Renewable Energy Source by the Department of Energy (DOE). 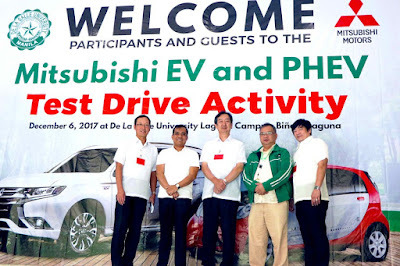 The next day over 100 students and professors from DLSU Laguna campus and University of Perpetual Help System Laguna have experienced driving the Mitsubishi Outlander PHEV and i-MiEV at the De La Salle University Laguna Campus. This event was also attended by Santa Rosa City Vice Mayor Arnold B. Arcillas who expressed the local government’s support on this environmental initiative of the company. The symposium and test drive activities are part of the joint study which Mitsubishi Motors Corporation (MMC) and MMPC have initiated in collaboration with the Philippine government, members of the academe, and Meralco in order to lower environmental impact to society through automotive electrification. “As a leading EV and PHEV manufacturer, Mitsubishi Motors Corporation (MMC) together with Mitsubishi Motors Philippines Corporation (MMPC) would like to accelerate the joint study project with the Philippine government, academe and Meralco on how vehicle electrification can reduce carbon emission in the country. We also believe that the involvement of the academe would play an important role in validating EV & PHEV technology which is designed to lower dependency on fossil fuels which is harmful to health and the environment” said Mutsuhiro Oshikiri, MMPC President and CEO.